We’d love your help. 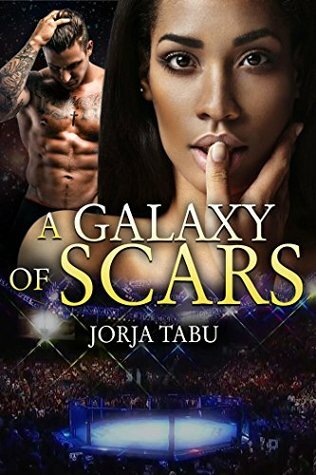 Let us know what’s wrong with this preview of A Galaxy of Scars by Jorja Tabu. Imani Cartwright left the rough world of her childhood in Virginia almost a decade ago. Among the broken pieces she abandoned were her best friend, Monica, and the ruined young man that swore he would love her forever, Roman O'Malley. Her brother, Tyreke, a passionate advocate who turns to the UFC to save their neighborhood, can't forgive her for leaving. She hasn't spoken Imani Cartwright left the rough world of her childhood in Virginia almost a decade ago. Among the broken pieces she abandoned were her best friend, Monica, and the ruined young man that swore he would love her forever, Roman O'Malley. Her brother, Tyreke, a passionate advocate who turns to the UFC to save their neighborhood, can't forgive her for leaving. She hasn't spoken to anyone back home but her mother for over a year when the phone finally rings, and suddenly the rift between the past and her new life has grown too wide for anyone to cross... But Death. When her brother is murdered Imani has no one but old friends and enemies to turn to. Did Roman O'Malley, UFC Prize-Fighter and her brother's former best friend, kill Tyreke? What happened to Monica, the sweet young girl who was Imani's best friend? And if they're innocent, then who killed Ty? To ask other readers questions about A Galaxy of Scars, please sign up. I found A Galaxy of Scars to be a bit of a mixed bag. It was eloquently written and I had no problem envisioning the characters, the place, or the life that the characters were raised in. But my inability to connect or care about a majority of the characters, on top of the frequent journeys to the past really took away from the story. Although I don't have to love characters to enjoy a story, I do need to be thoroughly engaged to love a book. I'm giving this book a very tenuous 3 out of 5-star ra I found A Galaxy of Scars to be a bit of a mixed bag. It was eloquently written and I had no problem envisioning the characters, the place, or the life that the characters were raised in. But my inability to connect or care about a majority of the characters, on top of the frequent journeys to the past really took away from the story. Although I don't have to love characters to enjoy a story, I do need to be thoroughly engaged to love a book. I'm giving this book a very tenuous 3 out of 5-star rating. I felt it deserved more than a 2 because when it worked it really worked, but it's never a good thing when I can't stay engaged long enough to devour a book in one or even two sittings. The stages of grief in a lifetime. Imani and Roman both finally accepted what they meant to each other and more. While this book is categorized as a romance it's really more of a contemporary book that features a romance. It's a coming of age story of the main character Imani Cartwright. It's told completely from Imani's point of view and it focuses on her growth as a person. Overall, it was a good story but if your reading just for the romance element you may be disappointed. I gave it a four based on the story and characters. Readers looking for something out of the norm with characters you can relate to on some level will appreciate this book. Not sure about the previous comments, but this book was not good at all. Every person in the book had some kind of problem or weakness. This book did not grab and hold your attention. Romance author creating multicultural romance with suspense, contemporary and PN titles. Always HEA! I've written sixteen books ranging from steamy to sweet in the genres of contemporary, paranormal, and multicultural romance featuring sassy heroines and the men who love them. Please read each description carefully for plot and character details (BWWM, BWAM, and WWAM being three to look for). Foll Romance author creating multicultural romance with suspense, contemporary and PN titles. Always HEA! I've written sixteen books ranging from steamy to sweet in the genres of contemporary, paranormal, and multicultural romance featuring sassy heroines and the men who love them. Please read each description carefully for plot and character details (BWWM, BWAM, and WWAM being three to look for). Follow me for updates on my website, twitter and facebook page. UPCOMING TITLE: Breathless, the first in a new multicultural Paranormal Romance series following the clash of two ancient fae kingdoms... In Breathless we meet Princess Alsynna and Maddox, her sworn Alpha guard; in upcoming stories we meet many more lovers as their lives intertwine during the build-up to Alsynna's and Elfaven's final clash. BLACKSTONE FOREVER IS AVAILABLE NOW! The finale of the Blue Mountain Dynasty Trilogy is on sale and available for Kindle Unlimited Subscribers to read right now! These books are meant to be read IN ORDER and all cliff-hangers are resolved now that the final book is here. Katrina Storm is a self-made success. She's not afraid to fight hard for what she wants... Until she's confronted with the one thing she never has: love. To her eternal regret, it appears in the form of spoiled play-boy Fox Blackstone, the youngest billionaire in waiting for the Blackstone Empire. Caught in a whirlwind love affair, the pair are ripped apart and then thrown together again when Fox's Machiavellian maneuvers drag Katrina back in his world with an offer she can't refuse. What was his motivation all along? Did he ever really love her?